Appearance: Nia looks bitchy...that's the nicest way to put it. She sneers, is arrogant, and has a soft spot in her heart for a certain somebody. Nia is out for a bit of revenge, and looks angry (unless she looks beaten like a puppy). Her hair is wavy and reaches almost to her knees. She loves yellow clothes and finds somber colors such as gray & black boring. 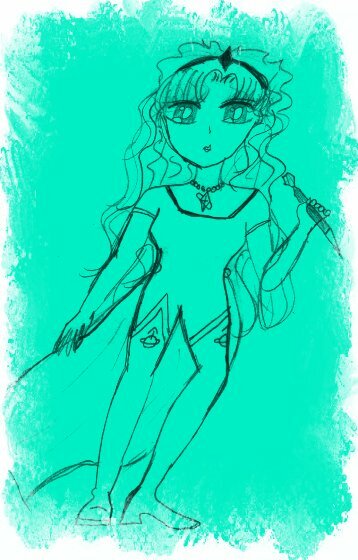 Weapons: She has her transformation locket, her father's Saturn Scepter, and her "husband's" Saturn Blade. She also has her mother's tiara (as well as her own). Attacks: Finale (like her father), as well as several untapped powers due to her current situation. Talisman: Her transformation locket, it allows her to change into a "Mana" form, as well as several other forms to blend in with whomever she needs to.